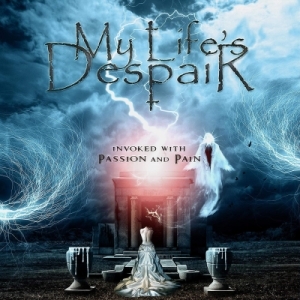 My Life's Despair put some history in their well-crafted Gothic Doom. Some things simply pique interest: in this case an introductory interview that arrived pretty much out of the blue. We see a lot of those which, frankly, don't contain much more than a Facebook 'About' paragraph - so it's always a pleasant change to get something in a little more depth. Veteran musician, Gothic Doom interest, mentions of gigs with Christian Death and The Mission, some self-deprecating humour and a sincere but realistic approach to music in the internet era: all things which sound right up my street. And so, here I am, spinning a copy of My Life's Despair's debut full length, finally arriving just over 20 years since founder Larshus started up the project. The band is now a duo, longtime friend N. Sanity having joined the multi-instrumentalist Larshus as an additional guitarist/bassist, with some additional guest vocals supplied by Lilia di Gracia, Alyssa Cassada and Eric Morris. Not exactly household names, upholding the very much self-sufficient and independent nature of the release - something that should not, in any way, be mistaken as a synonym for 'amateurish'. Aside from a website address where a label logo would normally reside, the packaging - and the recording, mixing and mastering - is indistinguishable from pro-quality all the way. You may struggle a little to retrieve any of the information or lyrics, however, printed as it is in tiny white-on-grey script which finally forced me to buy a 6x, LED-lit desktop magnifier to tackle (in all fairness, that's something age-related I did need anyhow...!). Thus equipped, the cover reveals a selection of loosely-coupled vignettes, linked by themes of suffering, loss and horror: not truly dark enough to be an auditory Grand Guignol, perhaps, but certainly capturing something of that desire to create an experience of eerie and macabre contrast. That extends to the music, not just the lyrics, with a varied selection of styles, broadly under the guitar-led Gothic/Doom umbrella, brought into play. Opener 'As Flames Ignite' has a hoarser Morten Veland's Sirenia feel to it, 'A Caress Of Stars' (unsurprisingly) is a doomier Tiamat, 'No Hope For Tomorrow' dips into The Awakening's Ashton Nyte territory, 'Regrets' gets a Catastrophe Ballet vibe...anyway, you get the picture and it's not that the namedropping is particularly important, except to highlight the wide spread of elements, dating back as far as the heyday of Gothic Rock, that are involved. That makes it a difficult album to pigeonhole under any particular style, though in Gothic Doom terms it sails closest to the harder-edged melodic and mid-tempo light-and-shade shores originally defined by Paradise Lost. Choral elements, keyboards, female vocals and the occasional sample notwithstanding, there's very little of the soft bombast of the symphonic/romantic school to be found here. Perversely, the disparity between tracks actually makes for a very complete album: Larshus has a nice line in creating genuinely catchy hooklines, mixing up a neat selection of clean and hoarse, snarling vocals, and - as an experienced drummer - backing that up with a more-than-decent battery of percussion. Those constants anchor the variety, making it a welcome addition rather than a distraction. And if the venomously croaking voice sometimes sounds a little forced, it still manages to fit the mood, in much the same way Vincent Price could carry off a simultaneously over-the-top yet menacing role. Which, I think, is a decent simile for what sums 'Invoked With Passion And Pain' up best: it's a charismatic album, one which still manages to charm, whichever way it twists and turns through different moods and inspirations. It may be that this will have more of an instant appeal for those already familiar with the dark Gothic canon of the '80s and '90s, but the flip side of that particular coin is it's also a pointer back to those roots for anyone who hasn't yet come across them. If you like this, then any or all of the bands mentioned above may also be of interest. Not forgetting, of course, that it's a compelling and well-made album in its own right, particularly when considering its DIY origins. Very recommended, in my book. Visit the My Life's Despair bandpage.